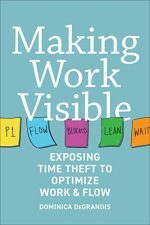 Making Work Visible: Exposing Time Theft to Optimize Work & Flow Dominica Degrandis. While drawn largely from the realm of software design and development, Making Work Visible offers advice that applies to all forms of knowledge work. We’re all familiar with the problems; too many demands, arbitrary deadlines, constant interruptions. Degrandis offers practical advice on two levels. First, she lays out simple practices that anyone can use to see the work they are being asked to do and use that visibility to get more of the most important things done. Second, she offers a deeper look at a better way to look at knowledge work than our current bias toward thinking that knowledge work is a form of factory work. Obviously, I was drawn to this book given my own interest in the challenges created by the invisible nature of knowledge work. We all know that we should be working on the highest value tasks on our lists, that we should carve out the necessary time to focus on those tasks, and that we are lying to ourselves when we pretend that we can multitask. It isn’t the knowing that’s hard, though, it’s the doing. Degrandis offers simple methods to accomplish that anchored in the theory and practice of kanban; make the work to be done visible, limit work-in-process, and focus on managing flow. I’ve claimed that Degrandis offers insight into the limitations of viewing knowledge work as factory work. Is it a contradiction that the solution is drawn from the Toyota Production System? Not if you understand why kanban differs from our myths about factory work. The purpose of a kanban system is to make the flow of work visible, then focus on making and keeping that flow smooth. You search for and eliminate spots where the flow slows down. You focus on the rhythm and cadence of the system as a whole. You learn that you cannot run such a system at 100% capacity utilization. As with a highway system, 100% capacity utilization equals gridlock. What makes this book worth your time is that Degrandis keeps it simple without being simplistic. She offers a good blend of both “why to” and “how to.” That’s particularly important because you will need the whys to address the resistance you will encounter.